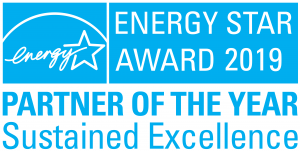 [St. Paul, Minn. April 9, 2019] – EnergyPrint, a national utility data management and measurement services provider, is proud to announce it has received the 2019 ENERGY STAR® Partner of the Year Sustained Excellence Award from the U.S. Environmental Protection Agency (EPA). This marks the fifth consecutive year EnergyPrint has received the Partner of the Year Award and the third year the company has achieved the elite status of Sustained Excellence. EnergyPrint achieved Sustained Excellence status for its added innovation and resources to its Utility Dashboard, as well as finding new ways to integrate ENERGY STAR into its service to help clients easily benchmark performance and improve efficiency. In 2018, EnergyPrint developed an innovation to its Utility Dashboard to make compliance easier for clients. This new feature brought higher visibility to ordinance deadlines and better enabled EnergyPrint’s service team to proactively and efficiently submit hundreds of client buildings into compliance for benchmarking ordinances in cities across the U.S.
As an ENERGY STAR partner since 2010, EnergyPrint’s technology fully integrates with the Portfolio Manager tool—allowing the company to help their clients easily track ENERGY STAR scores, as well as achieve and maintain certification. EnergyPrint serves more than 60 of the top energy services, HVAC, mechanical and automation contractors across the U.S. and Canada, along with leading real estate and healthcare companies. PRESS RELEASE: EnergyPrint and Envizi have joined forces to simplify energy and asset optimization for building professionals in North America.